For Rangers with Uzma Bozai & The London Chatter. 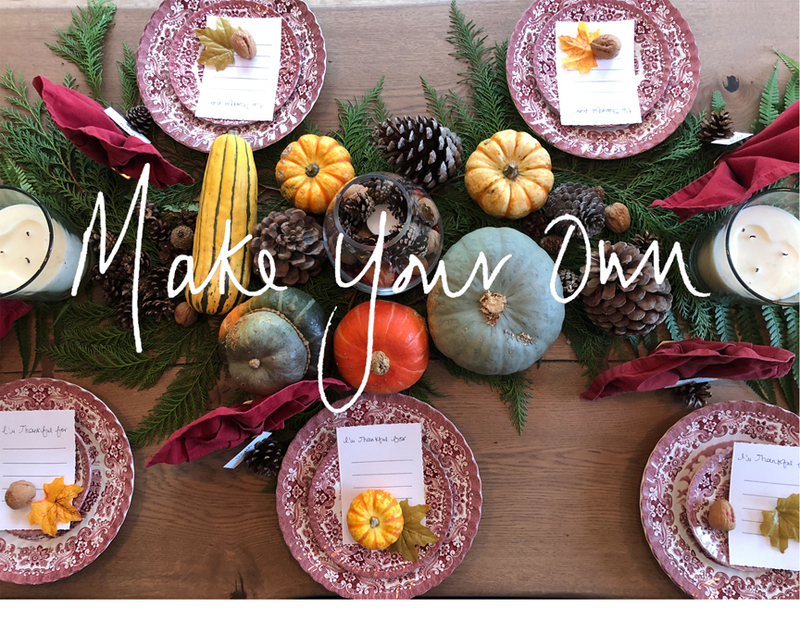 Setting the scene for her Thanksgiving celebrations, Uzma shares her step by step guide on how she creates the ultimate table setting for a beautiful get together. With layers of festive ferns and winter squash, this stunning table setting creates a theme perfect for any winter celebration. Your favourite china – layer up patterns or mix and match to make it your own. Heavy candles in glass jars or hurricane lamps. Linen napkins and napkin rings. The assembly is a joy and can be as simple or intricate as you like. You could get the whole family involved… if you’re not a perfectionist, but for those of you who like it just so, this is the perfect excuse to take some time for yourself and really get creative. Layer the fern through the centre of the table in place of a table runner, and then place your candles which will be the building blocks of the display. Next, add the squash. Choose brightly coloured squash of all different shapes and sizes and place between the candles – to create the wow effect, make sure you fill the centre of the table from end to end. Scatter around the pinecones and anything else – we added walnuts which is a great festive touch. Lay up your plates for all savoury courses to create interesting layers and then add a thanksgiving touch with a hand written note – I’m thankful for… your guests can write what they’re thankful for and you can read them out over dessert. A mini squash creates the perfect paperweight to keep the handmade paper in place. Next add your napkins – since I was young we’ve always folded our napkins to create turkey tail’s… here’s how we do it. Fold the bottom up, again leaving 1.5 in space from the last fold. From the left side, fold in 1.5inches, then fold again in the other direction until you have created an accordion style fold. Add a simple napkin ring to the bottom and fan out the top – there you have it – a turkey tail inspired napkin!